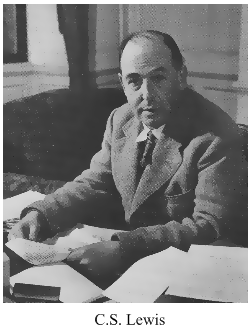 "Professor Radaker's portrayal of C. S. Lewis mesmerized the audience. It was a tour de force! His voice and physical appearance were a near double for Lewis. Even those familiar with some of Lewis' writings came away feeling as if they had met Lewis in a new and wonderful way. This is a performance no one, familiar or not with Lewis' works, should miss!" 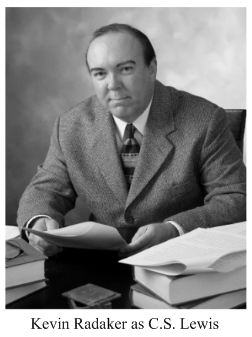 "I do not know how anyone could do a better job of choosing passages from Lewis' works to provide as clear an understanding of the man in a seventy-minute program. I recommend the program very highly." To see video clips of a 2010 performance, click here. "A Visit from C. S. Lewis" is now available to offer the voice of the most highly acclaimed and popular Christian writer of the twentieth century to your place of worship, campus, library, or organization. In 70-75 minutes (or 40 minutes, if the venue desires a shorter program), Lewis tells the story of his conversion to Christianity and goes on to address such topics as pain and suffering, pride, free will, love, grief, anxiety, and prayer. Nearly half of Professor Radaker's longer script is taken from Lewis' autobiographical work, Surprised by Joy (1955), in order to highlight the amazing story of his conversion to Christianity. The rest of the script weaves together passages from twelve more of Lewis' nonfiction writings, illustrating to some degree the vast array of theological issues and aspects of the Christian life that he addressed in his nonfiction. Throughout the entire performance, Radaker's meticulous imitation of Lewis' voice and dialect offers the sparkling wit, keen intelligence, and elegant prose of C. S. Lewis. This outstanding dramatic program is certain to entertain, educate, and inspire any audience as it takes them back to 1963 and asks them to imagine listening to C. S. Lewis in a London church. Professor Radaker's research efforts in developing this dramatic portrayal received support from the Anderson University Falls Fund for Faculty Development and from the Lilly Endowment. Web site designed by Paul Radaker.